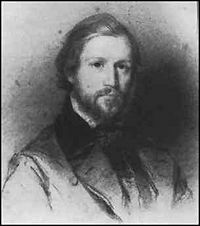 Charles-Valentin Alkan (November 30, 1813 – March 29 1888) was a French composer and one of the greatest virtuoso pianists of his day. His compositions for solo piano include some of the most fiendishly difficult ever written, and performers who can master them are very few. His attachment to his Jewish background is displayed both in his life and his work as he strove to create his culture-bound values along with later universal values which combined his prodigious musical talent and his growing personal responsibilities to his spiritual and secular worlds. Alkan was born Charles-Valentin Morhange to a Jewish family in Paris, where his father lived as a music teacher. Charles-Valentin and his brothers, who were also musicians, used their father's first name, Alkan, as their last. Charles-Valentin Alkan spent his life in and around Paris. His only known excursions were a concert tour in England in 1833-1834, and a brief visit to Metz on family matters in the 1840s. Alkan was a child prodigy. He entered the Paris Conservatoire at the age of six, where he studied both piano and organ. His teachers included Joseph Zimmermann, who also taught Georges Bizet, César Franck, Charles Gounod, and Ambroise Thomas. At the age of seven, he won a first prize for 'solfège', and at the age of nine, Luigi Cherubini described his technique and ability as extraordinary. His Opus Number 1 dates from 1828, when he was 14 years old. In his twenties, he played concerts in elegant social circles and taught piano. His friends included Franz Liszt, Frédéric Chopin, George Sand, and Victor Hugo. By the age of twenty-four, he had built a reputation as one of the great virtuoso pianists of his day, rivaling other touring virtuoso composer-pianists of the day such as Franz Liszt, Sigismond Thalberg, and Friedrich Kalkbrenner. Liszt once stated that Alkan had the most perfect technique he had ever seen. At this time, because of various personal problems and financial reverses, he withdrew into private study and composition for the remainder of his life, with only occasional forays back into the limelight. In spite of his early fame and technical accomplishment, he spent much of his life after 1850 in obscurity, performing in public only occasionally. In his last decade he emerged to give a series of 'Petits Concerts' at the Erard piano showrooms, which featured music not only of his compositions but those of his favorite composers from Bach onwards. He was occasionally assisted in these concerts by his siblings. Those attending included Vincent d'Indy. There are periods of Alkan's life about which little is known, other than that he was immersed in the study of the Bible and the Talmud. It appears from his correspondence with Ferdinand Hiller that Alkan completed a full translation into French of both the Old Testament and the New Testament from their original languages. This has been completely lost, as have many of Alkan's compositions. Amongst the missing works are some string sextets and a full-scale orchestral symphony, quite different from the Symphony for piano solo in opus 39, which was described in an article in 1846 by Léon Kreutzer, to whom Alkan had shown the score. The pianist Elie-Miriam Delaborde (1839–1913) is generally believed to be Alkan's illegitimate son. He was taught by Alkan in his youth and performed and edited many of Alkan's works. Alike his father, he was a notable pédalier player or performer at a pianoforte with a pedal keyboard. Tomb of Charles-Valentin Alkan, Cimetière de Montmartre, Paris. Alkan died in Paris at the age of 74. For many years it was believed that his death was caused by a bookcase falling on him in his home, brought down as he reached for a volume of the Talmud which he had placed on the highest shelf (in the position closest to Heaven). This apocryphal tale, which appears to have been circulated by Delaborde, has been effectively disproved by Hugh MacDonald in an article in the Musical Times (vol. 129, 1978 - More on Alkan's Death), in which he reports a contemporary letter from one of Alkan's pupils explaining that Alkan had died following being trapped beneath a falling port-parapluie (a heavy coat/umbrella rack). The story of the bookcase may have its roots in a legend told by the Rabbi Aryeh Leib ben Asher Gunzberg, known as 'Shaagat Aryeh', rabbi of Metz, the town from which Alkan's family originated. 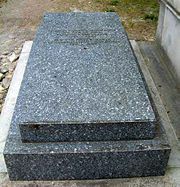 Alkan is buried in the Cimetière de Montmartre, Paris. A myth also circulates about an alleged obituary of Alkan, cited as fact in Ronald Smith's biography of the composer and since widely quoted, credited to the magazine 'Le Ménéstrel', beginning with the words "Alkan is dead. He had to die in order to prove his existence." No such obituary appeared in 'Le Ménéstrel' and none has been located to date in any other contemporary journal. Like Chopin, Alkan wrote almost exclusively for the keyboard, although in Alkan's case this included the organ and the pédalier, of which he was a noted proponent. Some of his music requires a dazzling virtuosity, examples of his compositions calling for velocity, enormous leaps at speed, long stretches of fast repeated notes, and the maintenance of widely-spaced contrapuntal lines. Notable compositions include the Grande Sonate Les Quatre Ages (opus 33), depicting the Four Ages of Man, and the two sets of etudes in all the major and minor keys (opus 35 in the major and opus 39 in the minor). These surpass even the Transcendental Etudes of Liszt in scale and difficulty. The opus 39 collection contains the Symphony for Solo Piano (numbers four, five, six and seven), and the Concerto for Solo Piano (numbers eight, nine and ten). The concerto alone takes nearly an hour to play, and presents a great challenge to the performer. Number twelve of Op. 39 is a set of variations Le festin d'Esope ("Aesop's Feast"). He also composed other programmatic pieces, such as Le chemin de fer (1844) which may be the earliest composition giving a musical picture of a railroad. His chamber music compositions include a violin sonata, a cello sonata, and a piano trio. One of his most bizarre pieces is the Marche funebre sulla morte d'un papagallo (Funeral march for a parrot), for three oboes, bassoon and voices. Musically, many of his ideas were unconventional, even innovative. Some of his multi-movement compositions show "progressive tonality" which would have been familiar to the later Danish composer, Carl Nielsen. For example, Alkan's first chamber concerto begins in A minor and ends in E major. He was rigorous in avoiding enharmonic spelling, occasionally modulating to keys containing double-sharps or double-flats, so pianists are occasionally required to come to terms with distant keys such as E# major and the occasional triple-sharp. Alkan seems to have had few followers, although his admirers included Ferruccio Busoni and Anton Rubinstein. The latter dedicated a concerto to him. Debussy and Ravel both studied his music under teachers who knew Alkan personally and noted their debt to his examples. The composer Kaikhosru Shapurji Sorabji promoted Alkan's music in his reviews and criticism, and composed a work with a movement entitled Quasi Alkan. Alkan's organ compositions were known to César Franck, Camille Saint-Saëns and others and their influence can be traced in the French organ school up to the present day. For many years after his death, Alkan's work was almost completely forgotten. There has been a steady revival of interest in his compositions over the course of the twentieth century. Works by Alkan have been recorded by Egon Petri, John Ogdon, Raymond Lewenthal, Ronald Smith, Jack Gibbons, Mark Latimer, Stephanie McCallum, Marc-André Hamelin, and Dmitry Feofanov, among others. Op. 45, Salut, cendre de pauvre! Charles Valentin Alkan's great virtuosic pianistic abilities enabled him to create the very complex and challenging piano works which rivaled those of Liszt and Thalberg in their energy, density and excitement. It appears that Alkan's study and understanding of the Bible and the Talmud were put into compositions such as "Les Quatre Ages" (op. 33) and the two sets of etudes for the piano wherein one hears the internalizing of an other-worldly existence which Alkan created with sound and rhythm from the piano. He may have composed these pieces to be extraordinarily difficult only to emphasize that the pathway to heaven is one with multiple and arduous steps to overcome. History of "Charles Valentin Alkan"